It took Jeff Bezos a couple attempts before he settled on the name Amazon for the internet enterprise he envisioned back in 1994. In the end, he turned to a dictionary and decided that the word Amazon embodied many of the qualities he felt matched his vision. The entire Amazon region was exotic and different, just as he planned to do something with his business that had never been done before. More importantly, the Amazon River itself was the largest in the world and he planned to turn his online bookstore into the largest bookstore the world had ever known. Today, Amazon is not only the largest bookstore in the world but also the largest online retailer by revenue and market capitalization. For sellers on the platform, however, Amazon.com often takes on the more wildly ruthless and cutthroat qualities of the Amazon jungle than anything else. Competition is high and no one is really looking out for you. Amazon is completely customer-focused so they are not always sympathetic to the challenges you will face as a seller. To Amazon, you are an easily replaceable commodity. Just as in the actual Amazon jungle, survival of the fittest seems to be the name of the game. This truth becomes painfully clear to anyone who has ever had their listing hijacked. Amazon does not police hijacked products, so it is up to you to take on the offender and – if the situation demands it – present your case to Amazon in a way that they will actually care about the issue and take down the hijacker’s counterfeit product. The fear of being hijacked can keep many new sellers from even entering the Amazon marketplace, but hijackers should not be considered a substantial roadblock to running a successful Amazon business. Annoying? Yes. Time-consuming? At times. A temporary cut to revenue? Possibly. Starting your business on Amazon comes with many inherent risks – hijackers being just one of them – the key to success is knowing what to expect and having a plan of action in place should the issue ever arise. What are the consequences of getting hijacked? 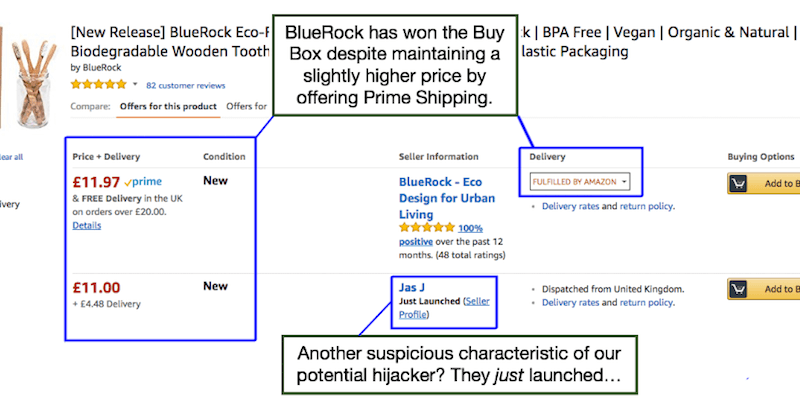 What does a hijacked Amazon listing look like? 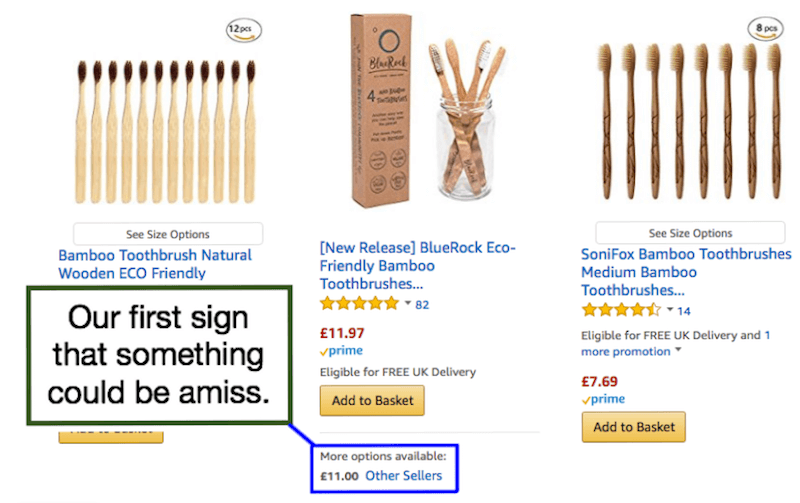 How do you get rid of an Amazon hijacker? How can you prevent hijackings from happening in the first place? If your listing has been hijacked, this typically means that someone is selling a similar or even counterfeit version of your private label product on your listing. You made the effort to create a branded and customized product, you’ve set up the perfect listing, and you’ve earned the Buy Box. You’ve essentially done ALL the work, ticked every box on Amazon seller's account checklist, but then someone comes along and lists their product on the listing YOU created, using your images, title, bullet points, description, etc. On top of this, they’ve listed a lower price than you and stolen the Buy Box. They have taken over your listing and stolen your revenue. Hijackers typically do this by offering a lower-quality counterfeit copy of your product or via bots that run on an algorithm. While some hijackers are Americans trying to take advantage of your business, most are Chinese sellers who can easily copy your product since most goods sold in the US are produced in China. Their version of the product will not have the same features, packaging, or quality as your customized private label product, but they’ll list their cheap knockoff right alongside yours and take your sales and brand reputation with them. The consequences of getting hijacked are probably quite evident from what we’ve already covered, but let’s dive into the details and understand just how much damage a hijacker can do. If there is more than one seller on a listing, Amazon will automatically designate one of them as the default seller of the product in question. If you are the default seller, you have the Buy Box. When a customer clicks the “Add to Cart” button, the seller with the Buy Box will get the sale unless the customer specifically changes their purchase to a different seller (which rarely ever happens). “Owning” the Buy Box gives you an incredible advantage because it basically guarantees you the majority of the sales. However, this means that if a hijacker manages to steal the Buy Box from you, they can essentially take all of your revenue without customers realizing that they are purchasing a counterfeit product. Once a customer has the counterfeit in their hands, they will likely be disappointed with their purchase and make their way back to your listing to voice their disappointment. Since they were unaware that Amazon gave the hijacker the Buy Box and that they didn’t actually purchase your product, there is a very high chance that they will proceed to your listing and leave a poor review about a product that you don’t even sell! This bad review can then damage your ratings and discourage potential customers from buying your product in the future. But hijackers can still do more damage. They can run bots that will thumbs-up negative reviews on your listing and delete 5-star reviews. They can also go into your listing and change titles, images, descriptions, product categories, and reviews. This is because the listing technically isn’t yours. All product listings actually belong to Amazon. So, even though you created it, anyone who sells the same item can alter the listing. You can begin to see why it is so incredibly important to identify and eliminate hijackers as soon as possible. You want to catch them as they’re getting on the “plane,” not as they’re taking over or sending your listing plummeting to its death. So, how can you catch a hijacker before it’s too late? The first step is to know what a hijacked listing actually looks like. In just a minute, we’ll get into more details of how you can automatically identify hijackers as well as go over the step-by-step process to get rid of them, but before we do, let’s take a look at what is visually different about the listing itself when you are no longer the only seller. 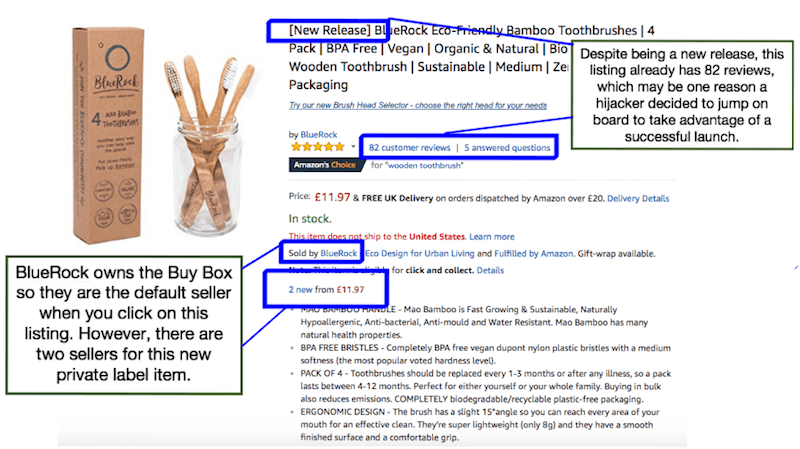 However, it is perfectly normal and acceptable under Amazon’s Terms of Service for other people to resell your product as “Used” (although it is hard to see anyone wanting to buy a used toothbrush in this case…) so we’ll need to do a bit more investigating to see if the other sellers are actually hijackers. Once we click on the listing, we can see that BlueRock is the original seller and still has the Buy Box, but there is one other seller. When you click through to compare the two sellers, we get some important information about the second seller. It appears that this brand new seller is trying to steal the Buy Box by offering a lower price. So far, it hasn’t worked thanks to BlueRock’s use of Prime Shipping. And when we look at Jas J’s product listing, it is the exact same as the original listing created by BlueRock except, of course, for the seller details. Finally, if we were to go back to the original search results and add the product to our cart, we can see that Amazon does very little to tell you which seller you are ultimately buying the product from except for the price. This is another confirmation that having the Buy Box is the game-changer. 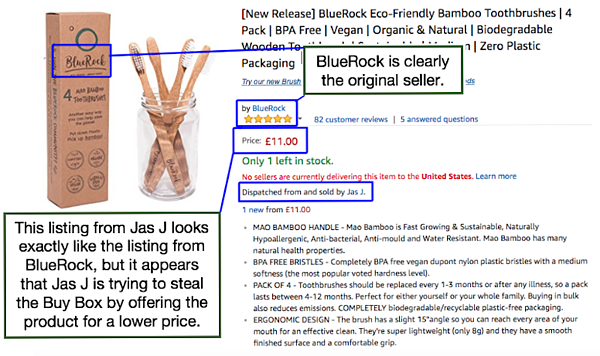 Unless someone were to go through all the work of clicking through to compare sellers and selecting Jas J’s product, they will automatically purchase BlueRock’s product. However, if Jas J can lure enough customers away from the BlueRock listing, they could eventually win the Buy Box and take over the listing. The first step is, of course, to know that you have been hijacked. You can always check your listings manually for the signs we pointed out above, or you could hire someone to manage your listings for you. You can also use automatic software services that will constantly check for hijackers and pull all of this information for you the moment it spots a potential offender. There are several services that will perform this function including Efficient Era, AMZAlert, and Bindwise, among others. The more units a seller has in stock, the more likely it is that they are a hijacker selling counterfeit products. You can determine how many units a seller has in stock with automatic software tools or by adding the item to your shopping cart and adjusting the number of units for purchase, starting with a high number (like 999) and working your way down until Amazon allows you to order that quantity. If the seller only has one product available, as is the case with our bamboo toothbrushes, it is possible that your potential hijacker is simply a reseller. While annoying, this practice is permitted on Amazon. However, do not let your guard down. Track the seller’s daily sales and if they begin to make sales and continue to have just one item in stock, it is likely that you have a rather astute hijacker on your hands. Your typical hijacker, though, will have a number of units in stock that are more than likely a fake version of your product. They are claiming to be the same thing, despite offering something of much lower quality. At times, these hijackers will try to copy your packaging, while others will create an entirely new look while still claiming to sell the same product. Once you are certain that your suspected hijacker really is a hijacker, the next step is to immediately send them a Cease & Desist letter. Whether this seems like an obvious step or a rather bold move, fast and direct communication with the seller can be incredibly effective. You can do this by going to the hijacker’s seller profile page on Amazon, clicking on “Ask seller a question” and then selecting “Other” for your type of inquiry. Then write and send your message. Note: Having your brand trademarked is key to making this particular template work. While it will cost a decent amount to trademark your brand, it is worth the investment if you are a serious seller. After you send your message, wait the 48 hours. If the seller has removed their listing in that time, you are done. You have taken care of the hijacker. If they have not removed their listing, proceed to the next steps. 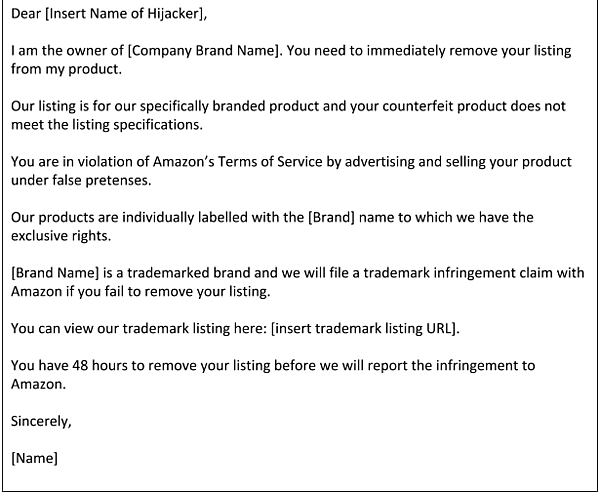 In order to report the hijacker to Amazon with any hope of them taking the hijacker’s listing down, you will need to prove that their product truly is counterfeit. To do this, you will need to use your personal Amazon Buyer account or have a friend use their account to buy one or more units (you’ll refund these sales later) from the hijacker. Pay whatever you need to pay for one-day shipping to speed up the process. The seller may recognize that you are trying to purchase the product and, suspecting your intentions, may cancel the order. If they do this, just keep ordering it until they either give up and let you order or take down their listing since this will likely drive them nuts and also hurt their metrics. If they manage to win the Buy Box, you can try lowering your price temporarily to beat them out. While you’ll make less profit, you will make even less if they steal the Buy Box from you. Once the product arrives, document every way in which it is counterfeit. Take photos, compare details between the two products, test the quality, and gather as much evidence as possible. Amazon may not care about you as a seller, but they do care A LOT about their customers’ experience. If you can prove to Amazon that a customer will be unhappy if they purchase the fake version of your product, you will have a winning argument. Submit your complaint to Amazon via this form. Remember, focus on how the fake product affects the customer and make every argument possible to prove that the hijacker’s product is significantly different from the original product you listed. Amazon doesn’t care if you’re brand registered, trademarked, etc., they care about sales, even if that means someone else is selling your product. So, don’t make the report about you, make it about how the hijacker is ultimately affecting Amazon and its customers. Also, make it very clear what it is that you would like Amazon to do regarding the hijacker. You can also report the hijacker by directly emailing seller-performance@amazon.com. Just remember to include all relevant information, including photos, order number, and the storefront URL. Either way, you should expect a response from Amazon within 48 hours. If Amazon still does not take down the listing, you can call in as a customer and open a counterfeit case against the seller. Demand a full refund for the product and request that they remove the seller because they are selling fake versions of the product you meant to buy. This will usually do the trick and the listing should be taken down. And that’s it. You’ve successfully taken down a hijacker! Ideally, you would never have to deal with a hijacker in the first place. 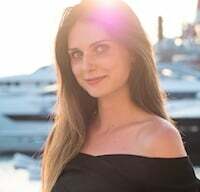 Yes, the steps above are highly effective at getting rid of a hijacker, but the following four suggestions are even more important as they will keep most hijackers from even attempting to take over your listing. These measures may not keep out every hijacker, but they will greatly reduce the likelihood of an attack. While Amazon won’t care whether or not your brand is registered when you report an infringement, registering your brand can help prevent hijackers. It does not prevent other sellers from selling your branded products, but it can keep out the counterfeiters and protect your listing. This is because registered brands can control their listings, making it less likely that someone can come in and change your product listing without your consent. You can register your brand in the Amazon registry here. It is a very simple process that will require some basic information about your company (including your company website). We have discussed at length the importance of creating a customized product when selecting items to sell on Amazon. Preventing hijackers is just another reason to add to that discussion. If you can create a unique brand with customized products, it will be much harder for a hijacker to replicate what you have done. And if you make that customization and branding clear in your listing, you can scare away most hijackers since it will be apparent that they won’t be able to produce the same branding in their product. If your photos do not show your branding on the product and packaging, retake them so that it is clearly visible. If your product is made of plastic, make the brand part of the mold and show that as well. Mention the brand in the listing and make it clear exactly what sets you apart. Even after improving your product branding and registering your brand, there is a chance that you will still get hijacked. If this happens, one of the easiest ways to show Amazon that your product is different from the hijacker’s is by bundling it with another product. And, if you do this from the beginning, it will be extremely difficult for someone to create an exact copy of your listing. Add value to your listing by offering something completely unique that cannot be mass produced. Perhaps you create a special carrying case for your product or you bundle it with a relevant eBook or a second item. It may be easy for a hijacker to copy one item, but it will be incredibly demanding to source two separate products. It may be possible for them to copy you, but it will be too much of a hassle for them to bother. After all is said and done, the most effective way to prevent hijackers is to avoid selling generic products readily available from China without modification or any added value. The easier you make it for hijackers to copy and paste, the more likely it is that they will. One last suggestions is to create a separate website for your brand. Depending on Amazon for all of your sales is a bad business practice in general. Use your Amazon business as a basis from which you can branch out and build your own loyal customer base. With tools like Shopify, Square Space, and even WordPress, it has become especially easy to create your own e-commerce channel. If you are not sure which tools are best for your Amazon FBA business, read our top recommendations. This will help you diversify away from Amazon, its many rules, and even the possibility of hijacking. Amazon even offers a white label fulfillment service that allows you to sell items on your site and still have the item fulfilled by Amazon. It may seem daunting to know that anyone could come in and take over your listing with cheap products and low prices, but it should not overwhelm you. You have resources to combat this type of fraud on Amazon. There is software available to catch hijackers the moment they show up and there are simple steps you can take to ensure they don’t stay long. Your first instinct may be to report them right away, but be sure to follow the steps we’ve listed above in the order that we’ve listed them to ensure that Amazon will accept your complaint if it comes to that. Be patient but quick to follow the steps we’ve outlined for you and you will be able to keep out the majority of the hijackers lurking in the shadows ready to prey on your success, and rapidly stop those who dare to ride your coattails. Focus on building your brand with quality, customized products and solid launch strategies and then keep these steps in your back pocket in case they are ever needed. If you do this, your success will only grow with time.